I may appear to be a very generous person. I care about people, I show compassion, I give of my time and money. However, it’s recently occurred to me that when confronted with conflict and tension, my seemingly kind, responsive heart turns to stone. I am so terrified of rejection. I run away, become obstinate, and I take the posture “I don’t really care.” My biggest trigger is being taken for granted and/or being taken advantage of. Does this sound familiar to you? Thankfully God offers truth and grace in times of distress. In truth, He asks us give unselfishly from love. God asks us to demonstrate love well through patience, kindness, faithfulness and determination. He asks us to not be boastful, proud, rude, irritable or jealous. That’s a tall order for a heart of stone! Not rude or irritable? That’s the place I go to when I’m hurt or defensive. Do you know the definition of patience is actually “not exposing another’s faults”. WHAT?! That’s the very definition of “venting to my friends!” It’s also the very means by which my heart gets harder and harder. Here’s the hardest truth for me accept about love: love is not selfish. I have to be willing to extend love without expecting anything from them in return, hitting on the very tender spot of being taken advantage of. Truth, the removal of my heart of stone from my flesh is painful and difficult and necessary to fulfill God’s demonstration of love to his people. In grace, even armed with the prayer “God please replace my hard heart in times of tension and conflict”, I am hurt so bad I can hardly breathe. Out of self-protection, I’ve had to guard my heart before. Unfortunately divorce will do that to a person. An area I was damaged will be an area I’m triggered by. I’m often caught of guard by these triggers because I did not really realize I am still carrying hurt in this area. Love is risky business. We are going to get hurt. We will be rejected, taken advantage of and knocked down. Grace, love never fails. God will ALWAYS catch the love we extend especially when it isn’t received by the person we’re giving it to. 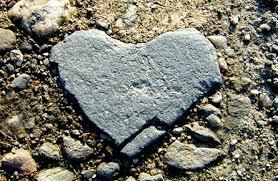 Thereby, removing our heart of stone (hurt and anger) and replacing it with a tender responsive heart. That’s super duper in theory isn’t it? Let me put this in practical every day terms: Do the generous thing even when it hurts because the more you do, the less it will hurt.